After studying the fifty U.S. state flags for some time, you begin to notice a few that don’t seem to fit in with the more average–and duller– designs. When the very ordinary ones are assembled, like a quilt, twenty-five of them look like this. Like 25 peas in apod–if you’ve seen one, you’ve seen practically all of them. The first things you note are the flags that stand out because of their attractive designs, like the ones we have pointed out before, e.g., New Mexico, Texas, Maryland, Tennessee, Arkansas, Kentucky, and a few others. However, others are noticed because of designs and symbols that each implies or sometimes curiously overstates. These could be useful as subjects for a “50-state Flag Trivia” series of questions. 1.) 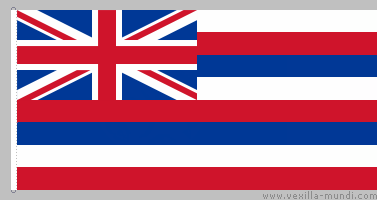 What U.S. State flag acknowledges another nation, which figured in the U.S. territory’s early history, and includes the image of the first nation’s flag in its flag design? 2.) 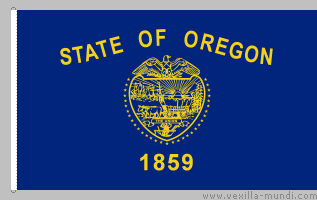 What U.S. State’s flag is really NOT a flag in the almost universally accepted form of a flag? 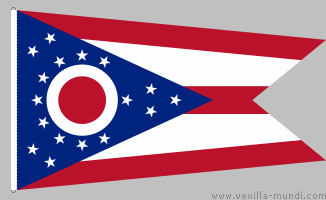 ANSWER: That would be Ohio, whose flag is actually called a “burgee.” It is a swallow-tailed shape. Seems more like a banner suitable for flying at a yacht club or on a boat. 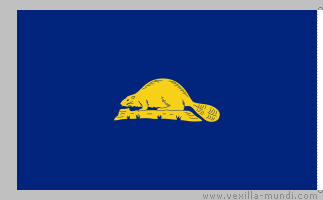 But it has been Ohio’s flag for a long time; and it IS fairly attractive, otherwise. 4.) 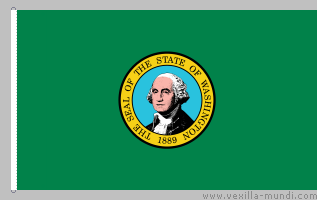 What U.S. state’s flag is unique for a couple of reasons—It is the only flag that has a field that is green instead of the usual blue (or white); AND it is the only flag with a portrait head of an historical personage as center to its design? ANSWER: If you said Washington state, you are correct. Centered in a circular frame in the field of green is the Gilbert Stuart portrait of George Washington, after whom the state is named, of course. We don’t know what you may do with this, your newfound knowledge of U.S. flags, but just be ready—it could come in handy at impressing someone else. ~ by marcstratton on 5 September 2007.